A few weeks back, the Kubernetes community gathered in Seattle for their annual KubeCon conference. The event is the centerpiece of the Cloud Native Computing Foundation (CNCF), in conjunction with the CloudNativeCon event. When KubeCon was held in Seattle in 2016, there were just over 1,000 attendees. In Austin in 2017, the number had grown to 4,500, and by 2018 the attendee list had expanded to over 8,000 people (with a waiting list). 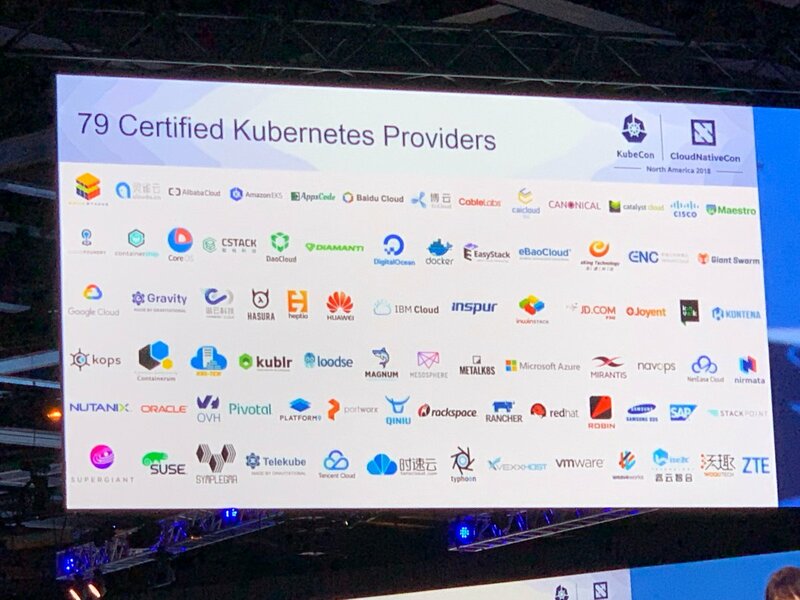 The growth was not only seen in the number of attendees, but in the number of pre-show events to train attendees, as well as the number of sponsors and companies displaying their Kubernetes technologies and services. How to make the core as stable (and scalable) as possible? How to build expandability around the core, without destabilizing the core and also allowing a broad set of use-cases? This creates a challenging set of decisions for the architects of the project, as they want to make sure the technology is stable enough for production use-cases, but also build in enough flexibility to allow for many types of applications to run on Kubernetes. Extensibility has been built around capabilities such as CRDs, CSI, and CNI. These models allow pluggability for both storage and networking, as well as add-on projects such as Istio, Knative and others. One area that is critical to this balance is the Operator Framework, which builds upon the extensibility of CRDs, while bringing automated operations and application lifecycle management to a broad set of applications that can run on Kubernetes. For the first four years of the show (KubeCon), Kubernetes has been at the core of every discussion. But as more and more add-on projects begin to make their way into greater levels of maturity within the CNCF (e.g. Istio, Envoy, Knative, Prometheus, etc. ), the focus will shift up the stack and onto projects that are closer to the application. We’re already seeing expanded focus on CI/CD tools, Service Mesh, Developer frameworks, Serverless and Registry/Security integrations. While there will always be a focus on the infrastructure and automated operations for Kubernetes, I would expect to see increased focus on improved ways to enable cloud-native applications on Kubernetes. While the container and orchestrator (Kubernetes) has become standardized, the development model for applications running on Kubernetes is still evolving. While there are many efforts to make it easier to embed tools in IDEs and create new languages and frameworks (Knative, Draft, Brigade, Ballerina, CNAB, s2i, Buildpacks, ODO, etc. ), there has yet to be a consensus around what is best or be more widely used by developers. The good news is that many projects are currently exploring this space, as well as many vendor offerings that are emerging. Since Kubernetes first started shipping (as OSS, Commercial Software and Cloud Services) almost 4 years ago, we seen it be adopted by companies around the world and in nearly every industry. As the market moves from early adopters to cross the chasm, mainstream adopters want to hear about the challenges and successes of the early adopters. For the last couple of KubeCon events, the number of companies speaking publicly (example) about their adoption has been growing. This means that concerns about adoption will be reduced, as companies now have references that they can reach out to directly.